Last week, Philippine Defense Secretary Delfin Lorenzana confirmed that the country would likely be moving towards the purchase of Sikorsky S-70 Black Hawk helicopters to fulfill its need of combat utility helicopters. The announcement bears watching within the perspective of Philippine military modernization and the country’s alignments more generally. As I have been noting in these pages, among the key items on the list within the Philippines’ ongoing defense modernization is helicopters. Following the cancellation of an earlier deal where the Philippines would buy combat utility helicopters from Canada – a procurement valued at around $230 million featuring between 12 and 16 helicopters – Manila this year had been considering a range of options, including Sikorsky’s S-70 Black Hawk, Russia’s Mi-171, South Korea Aerospace International’s Surion and Agusta Westland’s AW139. On December 7, in a sign of further inroads on this score, Philippine Defense Secretary Delfin Lorenzana confirmed that the Philippine Air Force (PAF) had selected the Sikorsky S-70 Black Hawk to satisfy part of its outstanding combat-utility helicopter requirement. Specifically, Lorenzana said that following from the fact that the PAF technical working group had come up with the recommendation of the Black Hawk, the Philippines would move forward with pursuing that. Lorenzana noted that the limited budget the Philippines had would dictate that probably around 16 aircraft would be possible, and that the pact would be inked probably by next year. While Lorenzana was careful in how he framed the decision and how it was made, some of the media headlines opined that the outcome had indicated that the decision meant that the Duterte administration was forced to choose the United States over Russia, especially in the wake of sanctions Washington has on the books against countries that bought arms from Moscow. To be sure, equating specific deals to broader alignment choices of course tends to obscure the complexities involved. For instance, in this case, the Philippines had considered several options apart from the Black Hawk and Russia’s Mi-171, including South Korea’s Surion and Agusta Westland’s AW139, and Lorenzana had disclosed that the Philippines would be buying helicopters from Turkey as well. Furthermore, there are other considerations that factored into the Philippine selection from a defense perspective that are separate from Duterte’s own alignment preferences for Russia that may not be publicly disclosed. Nonetheless, there is no doubt that U.S sanctions on Russia factored into the Philippine decision to some degree. Indeed, Lorenzana himself admitted as much, indicating that even though Russian helicopters were competitive in terms of pricing, it would be difficult for payment to be facilitated due to U.S. sanctions. But he also noted there were other factors that affected relative pricing too, including negotiations that enabled the Philippines to increase the number of Black Hawk helicopters it would be able to buy. How exactly the deal plays out remains to be seen. But given the attraction it has gotten within the perspective of Philippine military modernization and the country’s alignments more generally, it will remain an interesting space to watch in 2019. 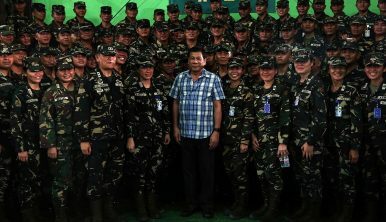 What’s in the First US-Philippines Downgraded Naval Exercise Under Duterte?What’s the Deal With China-Philippines Military Ties?Philippines’ New Anti-Submarine Helicopters Delivery in the Headlines with Inspection VoyageWhat Lies Ahead for the Philippines’ Anti-Submarine Helicopters?A New Philippines-Turkey Military Helicopter Deal?